Yes you read that title right. Flourless Chocolate Chip Cookies. 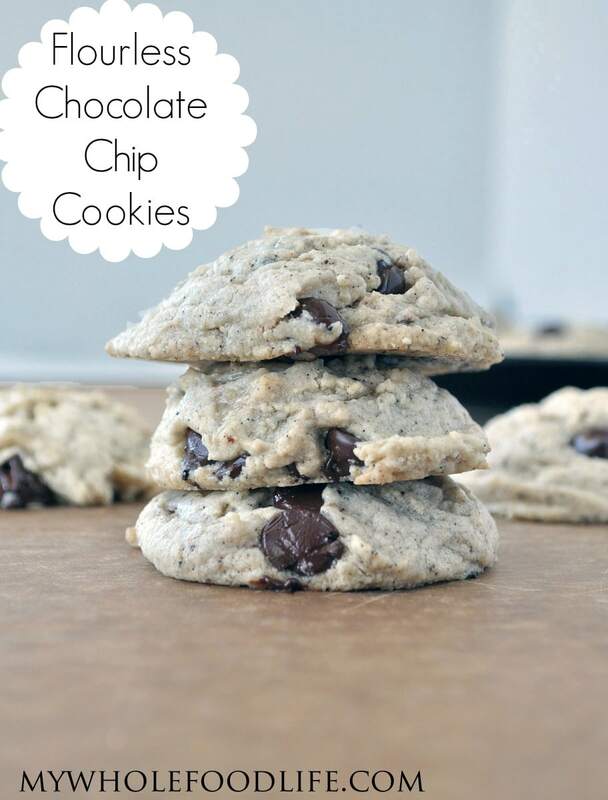 These healthy chocolate chip cookies contain no beans or any other funky ingredients. They also don’t contain any butter or oil. These flourless chocolate chip cookies are very easy to make and contain only 5 ingredients! If you like this recipe, you may also like my 4 ingredient flourless cookies or my super moist flourless brownies. These flourless cookies are rich in taste and texture. You will be very surprised! I had to stop myself before I ate too many! These flourless cookies are gluten free, vegan and grain free! You can make them in under 20 minutes. Can it get better than that? To make the cashew butter, follow the instructions in this video. For more videos, you can subscribe to my You Tube Channel. Here is a quick video on how to make these cookies. These cookies are so moist and decadent, you will never guess they contain no flour, no oil and no butter! In a food processor , combine all the ingredients, except for the chocolate chips. Pulse until everything is mixed. Drop cookies onto a lined baking sheet. I used a cookie scoop for this. You can also freeze them for longer. **You can buy cashew butter at most health food stores. You can also easily make it by grinding up 2 cups of raw cashews for about 5 minutes in a high powered blender or a food processor. I need to give these a try. I love cookies and I love how simple this recipe is. Can't wait to try these and that cashew butter recipe! Thanks Courtney! I hope you enjoy them! These sound incredible!! Pinning right now! Can soy butter be used in place of cashew butter? Allergic to nuts. This recipe looks INSANE. I can't believe that this is only made of a cashew butter base! What an amazing idea!! this is hands down the worst recipe i've ever tried. i should have known that there was nothing to "hold" the cookies together, and in fact, there's nothing to hold the cookies together. they're just a pile of mess on the cookie sheet. do not waste your time. terrible terrible recipe. i would give negative stars if i could. I'm sorry it didn't work out for you. :( It has a lot of positive reviews. Did you let the cookies cool before handling them? They will crumble if still warm, but they do firm up nicely. Also, do you think the dough could have been over-mixed? That may cause them to spread too much. Did you follow the recipe exact? I know your comment was a while back, but I was shocked to read it. These cookies are so delicious, I make them often and recommend to friends as well. Not once have I ever had them turn out like you described. Can't help but wonder if you did something wrong. I have made this recipe many times, and my family and friends love them. They are slightly more fragile if you eat them hot (but we don't mind), but they do firm up once they cool. Yes, the texture is slightly different from one containing flour, egg, butter, etc - but its a minor difference that doesn't stop us from enjoying a treat made with wholesome ingredients. This is one of our favorites! I don't know if homemade cashew butter is better but I don't like the flavour of these. They taste ashy. It is an interesting concept though. Not sure how yours look like normal cookies as mine are just puffs, but I will gladly try these again with peanut butter. I'm sorry you didn't like them with the cashew butter. They should also be good with peanut butter if you try again. Could you make this with almond butter too? It is what I have on hand. I made these last night using almond butter and they were AMAZING! thanks for the recipe.